On the 26th of January, a representative of Hellas Gold – daughter company of the Canadian mining company Eldorado Gold – pleaded for a reduction in the letter of guarantee for the rehabilitation of their New Kokkinolakkas Tailings Management Facility (TMF). This TMF is supposed to dispose of waste from the Olympias and Mavres Petres mines; from the new Madem Lakkos ore treatment facilities; as well as waste materials from old tailings and intervention areas. The mining company –which had a TTM revenue of $0.39 billion on April 3rd 2018 – claims to already have invested substantial amounts of money into cleaning and rehabilitation of old disposal sites. They believe that, therefore, they earn a reduction in the letter of guarantee. The responsible authorities, however, are not giving in. This is not so surprising if we look at the already turbulent history of this mining project. Hellas Gold bought 95% of the shares from the previous mining company present in the area in 2011, and from that moment on started developing several mining sites. 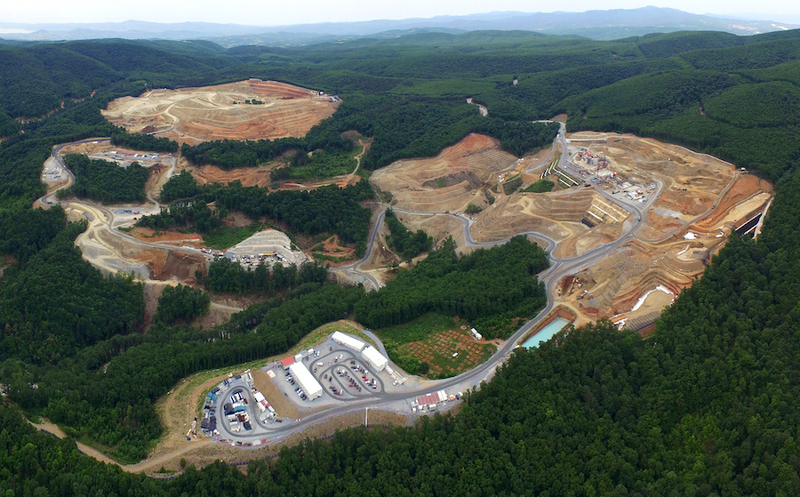 The company now owns several mines in the municipality of Kassandra, on the Chalkidiki peninsula in the north of Greece: the underground silver-lead-zinc mine Mavres Petres; the underground gold-silver-lead-zinc mine Olympias; and the combined underground and open-pit gold-copper mine Skouries. Parallel with the development of these 3 mines, there is also the development of the so-called ‘New Ore Treatment Facilities’ taking place in Madem Lakkos. The permits for these facilities, however, have not yet been approved by the Greek authorities. The New Kokkinolakkas Tailings Management Facility (TMF) is part of these treatment facilities. Since the arrival of the company to this area, the local population has been resisting against the mining activities. The main income of inhabitants of the Chalkidiki peninsula traditionally stems from farming activities, beekeeping and tourism. These activities are rooted in the rich biodiversity and astounding nature that characterises the area. As a result of the mining activities, ground water now flows away into deep holes drilled by the mining company and doesn’t reach farming fields anymore. The use of harmful chemicals impedes the growth of plants and lowers the biodiversity. Desertification will lead to soil erosion, and dust will prevent the trees from breathing, leading to their death. It is clear that the nature – and with this the source of income of the local population – is being destroyed by the mining activities. Furthermore, when the people take it to the streets to show their disagreement, their manifestations are violently suppressed by anti-terrorist police units and private security forces. One would expect the mayor of the region to support its citizens, but this is not the case. In fact, one of the citizens explains that the mayor of Kassandra was deputy Minister of Finance in 2011 the year when the government allocated the property rights of the territory to Hellas Gold. One could therefore say that the current mayor of Kassandra made it possible for the mines and all related problems to develop. The Greek government generally claims that the development of these mines is an opportunity for the region to develop, despite the strong opposition of the inhabitants of the area. The bad economic situation of the country makes that multinational companies such as Hellas Gold have a lot of power to influence policies. The company’s plea for a reduction in the letter of guarantee is just another practice of its power aimed at increasing its profits at the cost of the local population, financial gains for the Greek state and nature. It is to be hoped that the Greek government will stay strong and not give in to the pressure of the company. Money should never be prioritised over rights of people and rights of the nature. A letter of guarantee is an agreement between the mining company and the concerned state which states that in case collateral and/or unexpected damage occurs due to the activities of the company, the company will be obliged to pay a certain amount of money to the government. The company did so during a workshop on financial guarantees in the field of extractive waste management organised by the Directorate-General of Environment of the European Commission.